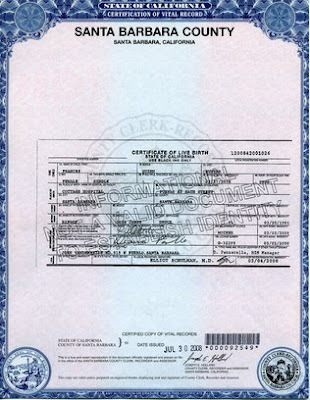 The birth certificate of a child who a tabloid newspaper claims is linked to former Sen. John Edwards doesn't identify a father. The certificate, obtained by The Charlotte Observer today, shows Frances Quinn Hunter was born Feb. 27, more than two months after an Edwards aide claimed to be the father. Andrew Young, a former Edwards campaign finance director, claimed paternity in a statement from his lawyer posted at the political blog mydd.com. The girl was born at Cottage Hospital in Santa Barbara, Calif., to RielleJaya James Druck, also known as Rielle Hunter. Hunter, 44, was a videographer on Edwards' presidential campaign last year. Ann Coulter: "Evidence is accumulating that John Edwards is right -- there really are "two Americas." There's one where men cheat on their cancer-stricken wives and one where men do not cheat on their cancer-stricken wives."